Former NYC mayor speaks to the press about Jewish identity, universalism - and everything in between. Former New York Mayor Michael Bloomberg spoke to the press before the Genesis Prize ceremony Thursday, addressing questions about the US-Israel relationship and Jewish identity. "Israel needs America, but America really needs Israel as well," Bloomberg said. "This is the only democracy in this part of the world, and it celebrates the same values that we do in America." "It is just terribly important that we recognize we have to stand together," he continued. "There should not be anything as close, in terms of international relations, as America and Israel." Bloomberg struck a universalist tone during the speech, while giving special reflection to the meaning of Jewish identity in the process. “My values come first and mainly from my parents, who were practicing Jews," he reflected. "Judaism was a part of our everyday life." Bloomberg stressed, however, that Israel "gives the opportunity of all religions, but particularly the Jews, a place to come, to be able to express themselves, to be in charge of their own destiny." "Jews have a particular responsibility to stand up for the freedom of other people, of other religions," he declared. "If we want to be able to make sure we practice ours, we have to make sure they practice theirs." On that note, he did not take a strong stand against assimilation. “I think everyone should make their own decisions about what they want to do," he said. "I’m very proud of being a Jew, and I think that doesn’t mean other peoples’ religions aren’t appropriate for them. I never think we should tell somebody else what they should believe or how they should pray." "I think assimilation is a fact that changes the character of society - some people like it and some people don't, and it's up to individuals," he added. Jewish values or universal values? 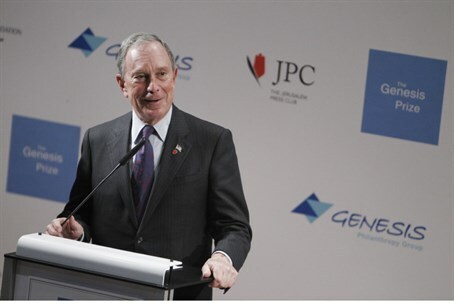 Bloomberg defined Jewish values as one interpretation of a spectrum of shared beliefs. “To me, Jewish values are a family, honesty, taking care of others, which I guess you’d call philanthropic," he said. But, according to Bloomberg, those values are not necessarily unique. “If you look at the other major religions, they have the same values. It’s a matter of how they instill those values in their congregations," he insisted. "No one religion has a lock on great people or terrible people. Unfortunately, there’s a spectrum in both cases." "To me the values I learned from my parents are probably the same values that I hope Christians and Muslims and Buddhists learn from their parents," he added. "They are all centered around 'God put us on this earth and said we should take care of each other."